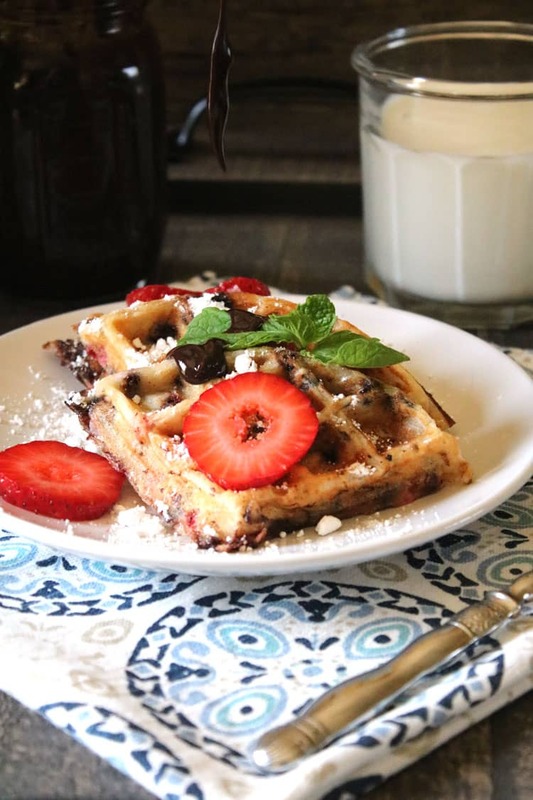 I love whipping up a quick breakfast like this Strawberry Chocolate Chip Waffle recipe. When we have a good breakfast in the morning we always get a good start to their day. I’m all for making the kids a good-for-you breakfast, but I don’t have a problem with adding a little sugar. You know, it worked for Mary Poppins, right? Now, these waffles have a little bit of powdered sugar sprinkled over the top, which is totally optional. But, doesn’t it make them look pretty? They also have a tiny bit of sugar in the waffles (okay, and in the chocolate chips)… BUT… they are also filled with good things: berries, applesauce, and more berries. So, they’ve got to be good for you, right? Okay… maybe they aren’t entirely healthy, but they do have ingredients in them that are good for you. 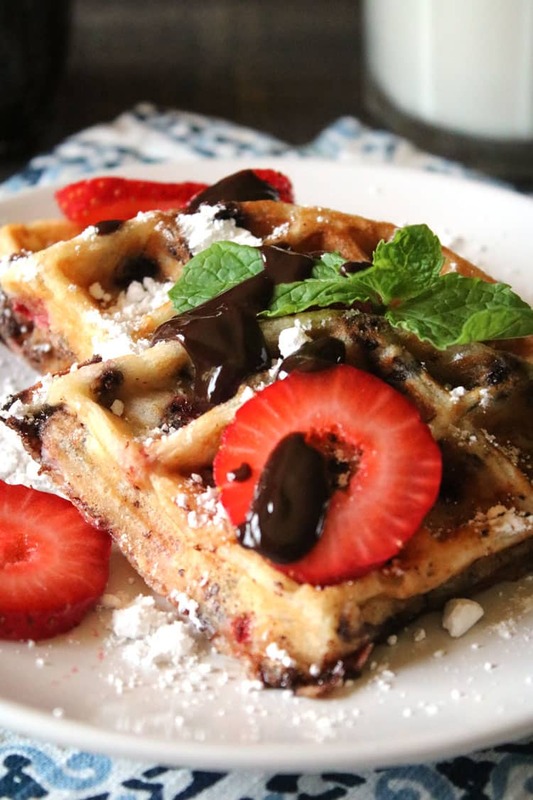 And Strawberry Chocolate Chip waffles are just plain delicious…even if they aren’t actually plain at all. And that’s a healthy balance. 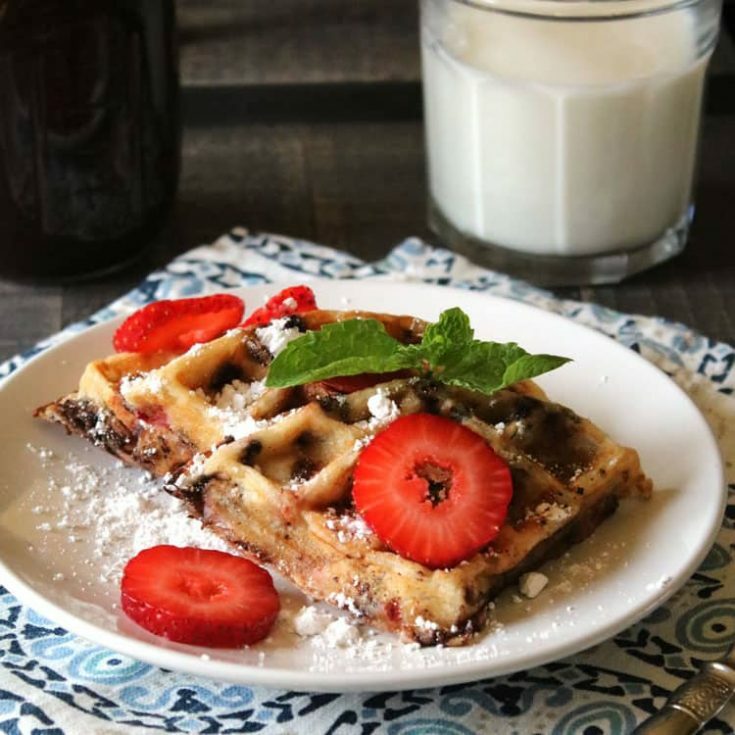 These waffles are so easy to mix up using my make-ahead Waffle Mix. My kids are strawberry fanatics. Love, love, love… and dare I say LOVE strawberries. As in, I made Strawberry Crepes and they gobbled them up. So, its no surprise that waffles with all kinds of goodness, piles high with strawberries and sprinkles of powdered sugar would hit the spot. You know what else would be good? Sliced up bananas. Maybe with some pecans and pure maple syrup or honey. 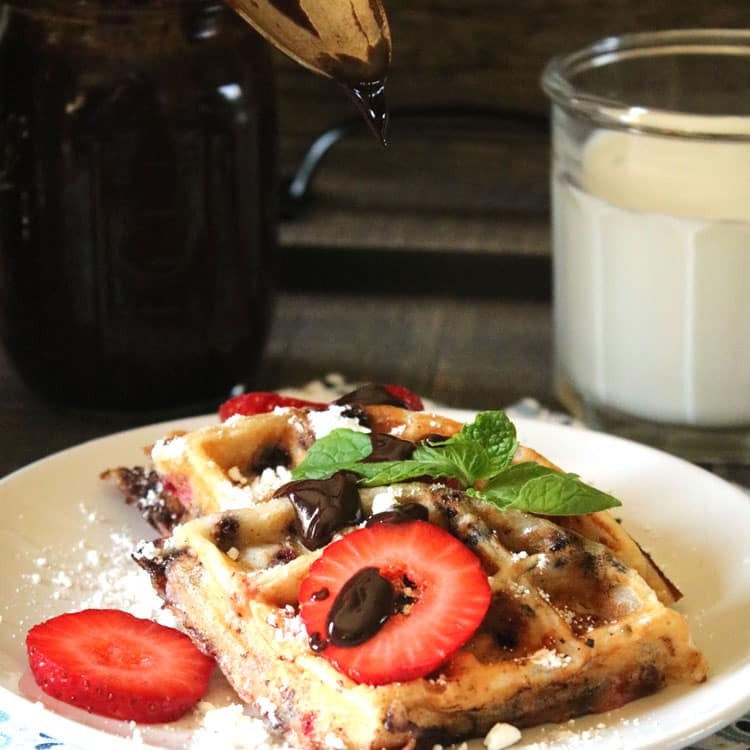 The berries that are added to the waffles could easily be swapped out for any number of goodies… which is one of the super fun things about cooking. I love to try new combinations and see what works. So… try the recipe as is, or throw in a few faves- you’ll be sure to end up with a waffle that is delicious! 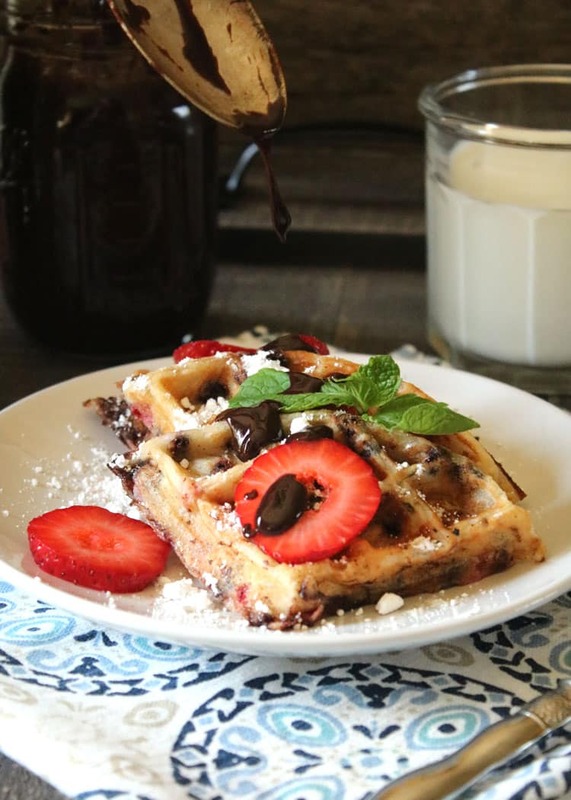 Add a scoop of vanilla ice cream and make this yummy waffle recipe a dessert waffle recipe. Ah, perfection! 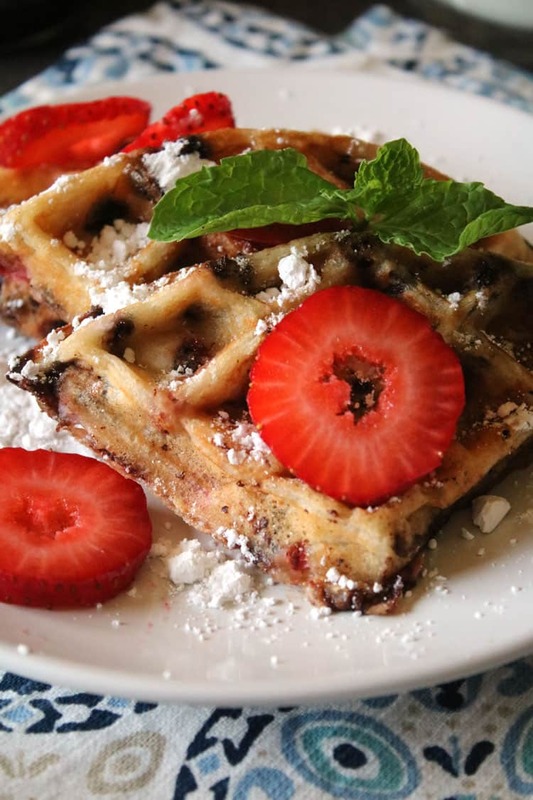 Pin our Very Berry Waffles for later. Yum! 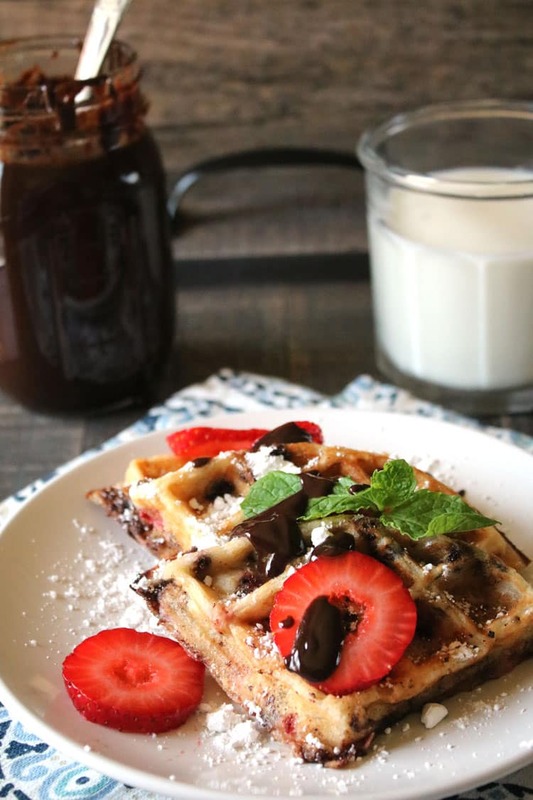 This Strawberry Chocolate Chip Waffle recipe is great homemade waffle recipe for weekday mornings and even for using as a dessert waffle recipe. Whisk together wet ingredients and then stir dry waffle mix into the wet ingredients. When they are mixed together smoothly, pour in chocolate chips. In a separate bowl, lightly coat chopped berries with one tablespoon of flour. Add the berries to the waffle batter and stir to combine the berries and chocolate chips. Yum. I just made these this morning! We love waffles here. We eat them at least twice a month but were content with plain ones. Now I may never be able to make plain ones again. I have no excuses because I have the mix made up too! P.S. No syrup or butter were harmed in the consumption of this meal.